The Manhattan Institute’s Avik Roy has just released a comprehensive and very impressive new study of the American healthcare system, “Transcending Obamacare: A Patient-Centered Plan for Near-Universal Coverage and Permanent Fiscal Solvency.” By 2025 it will increase insurance coverage by 12.1 million above Affordable Care Act levels. 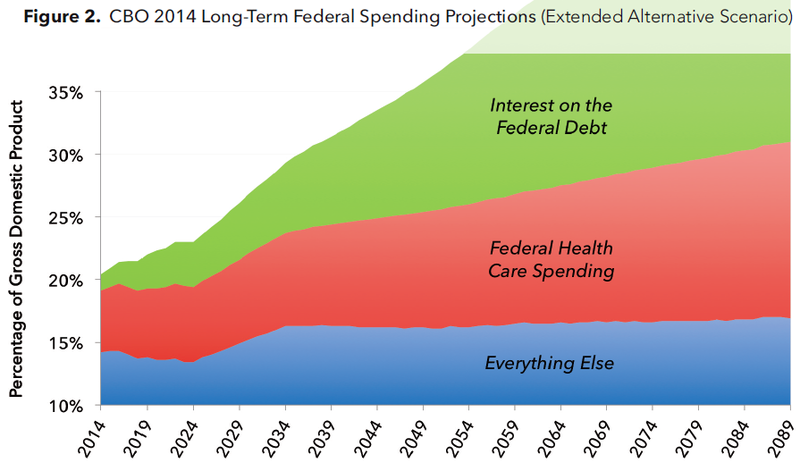 It will at the same time achieve a 30 year deficit reduction of $8 trillion compared to current CBO projections (see chart below). Exchange Reform. The ACA’s individual mandate is repealed. The Plan restores the primacy of state-based exchanges and insurance regulation. Insurers are encouraged to design policies of high quality tailored to individual need. By lowering the cost of insurance for younger and healthier individuals, the Plan will expand coverage without a mandate. Employer-sponsored Insurance Reform. The employer mandate is repealed, thereby offering employers a wider range of options for subsidizing employees insurance. Medicaid Reform. The Plan migrates the Medicaid acute-care population onto the reformed state-based exchanges with 100% federal funding. The Plan returns to the states full financial responsibility for the Medicaid long-term care population. Medicare Reform. The Plan gradually raises the Medicare eligibility age by four months each year forever. The end result is to preserve Medicare for current retirees and to maintain future retirees on their exchange-based or employer sponsored health plans. Other Reforms. The Plan tackles the growing problems of hospital system monopolies and malpractice litigation and also accelerates the pace of medical innovation by reforming the Food and Drug Administration. These reform proposals are amazingly ambitious and far reaching in scope. How can they possibly be achieved? Stay tuned! This entry was posted in Avik Roy, Employer Mandate, entitlements, fiscal sustainability, Individual mandate, Jack Heidel, Manhattan Institute, universal exchange plan and tagged employer mandate, entitlements, fiscal responsibility, hospital system monopolies, individual mandate, jack heidel, Medicaid, Medicare, universal exchange plan by jackheidel. Bookmark the permalink.